Yesterday, the Q&A from the estimable David Laurila focused on relievers of the 70’s and 80’s, so I thought I would take a look at some relievers from that era. During the 1970’s, relievers began to take on the importance that they have today. But back then, they were used far differently. In the process, many stars were born. Going down the list of most valuable relievers for the decade, you surely recognize the names that reside in the top five, three of whom are enshrined in Cooperstown — Bruce Sutter, Rollie Fingers, Mike Marshall, Rich Gossage and Sparky Lyle. The next name on that list, Jim Kern, might be a little less well known, but he had a significant impact nonetheless, albeit for a shorter period of time. 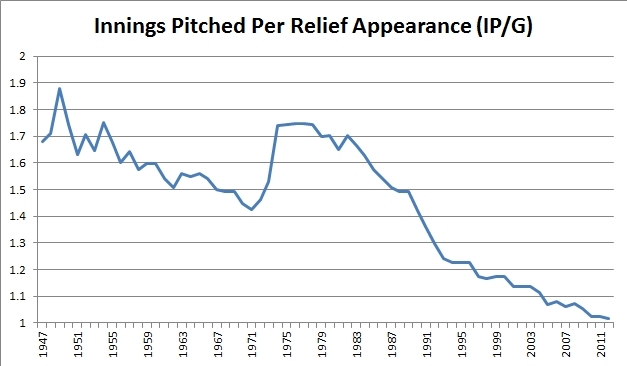 In the 50’s, relievers weren’t valuable at all. That ramped up a little bit in the ‘60’s, as players like Hoyt Wilhelm began to take hold. But in the ‘70’s, it all changed. In 1974, relievers totaled more than 40 WAR for the first time. And aside from the strike-shortened 1981 season, relievers have totaled at least 40 WAR in every season since. 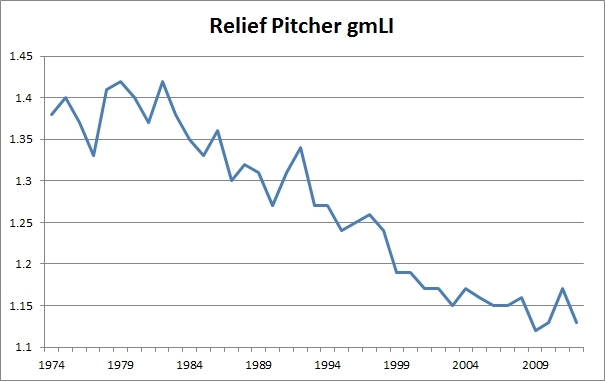 Then in 1977, relievers crossed the 60 WAR plateau. There have been a few seasons that have dipped under 60 WAR since, but for the most part that is also a line that is always crossed, especially today — 2007 was the first season in which relievers surpassed 100 WAR, and they did so again this past season. All of a sudden, instead of averaging 1.4 innings per appearance, the average appearance shot up to the 1.7 range, and stayed so for the rest of the decade. When you hear analysts trumpet the halcyon days of the 100-inning reliever, these are the days to which they are referring. Now, to be sure, this is skewed by the fact there are more relievers plying their trade today, and as a result they enter earlier in games, when situations may not be as critical. Having said that, we will see below that the choice relievers of the ‘70’s still were used in higher leverage situations than their counterparts from today. When we think of relievers, we often think of words like “fungible,” and “unreliable.” So when a reliever is consistently good, it is worthy of note. It is for this reason that Gossage, Sutter and Fingers find themselves in the Baseball Hall of Fame, and why Lee Smith is on the doorstep. And while Kern didn’t have quite the career that those four pitchers did, for a time he was quite dominant. We can see a few things in this list (besides the fact that Mariano Rivera really has just been on another planet). First, we can see how exclusive this club is. Among the names you do not see are Fingers, Billy Wagner, Robb Nen, Rick Aguilera, John Wetteland and Jay Howell, to name just a few. Second, we can see that most of the relievers on this list pitched in the last couple of decades. Only two of the 43 streaks started in the ‘60’s, and only three started in the ‘70’s. So it wasn’t like Kern was just another face in the crowd — he was one of the few standout relievers of his time. Third, we can see that despite the fact that elite modern relievers still enter games in much more critical situations, they don’t quite get to the level that Kern, Sutter and Gossage were at in the ‘70’s. In looking at Kern specifically, we can see that no one even touches him in terms of innings pitched, and only Sutter was in his league in terms of gmLI. Expanding the realm past these 43 pitchers, we see that Kern’s career 2.00 gmLI as a reliever ranks fourth all-time, and that number is watered down by his later years. From ’76-’79, his gmLI marks as a reliever were 2.47, 2.19, 2.26 and 2.40. All four of those marks place in the top 75 seasons of all-time — only Gossage has as many seasons in the top 75. Simply put, for those four years, Kern worked harder and in more pressure-packed situations than just about every other pitcher in baseball history. Of course, four seasons does not a career make. After he tossed his epic 143 innings in ’79, Kern wasn’t able to shoulder the same workload in the next two seasons, as he accumulated just 93.1 innings in the next two seasons. He once again hit the 100 inning plateau in 1982 (though he did start one game that year) but it was all downhill for him after that — he managed to hang around in the majors for four more years with four different teams, but he only amassed 57 innings in that time, and retired after the 1986 campaign. Kern didn’t serve as a cautionary tale or anything like that — there have been 144 100-inning seasons by a reliever since 1982. But only six of them have come since 2000, and none since Scott Proctor’s 2006 campaign (which may actually have served as a cautionary tale). As such, it makes Kern’s late ‘70’s run stick out just a little more. He didn’t have a Hall of Fame career, but in that narrow window when relievers were barrel-chested mighty lords who wrestled bears with their bare hands, few did it better than Jim Kern. We hoped you liked reading Jim Kern’s Four Incredible Seasons by Paul Swydan! Looks like Kern also blew his arm after that 79 season.